Her real name is Beryl, and she’s my mom. But in the local theatre community, she’s a superstar costume designer known by her ‘stage’ name. Meet Carmenta. Yes, she’s a one-name wonder. Like Cher. In the wings for over 20 productions in the past 30 years, Carmenta has done it all. Wardrobe, makeup, hair, set painting and assistant stage managing. And at 82, she’s still kicking in the costume department. In 2015, Carmenta won the Arthur Wilkinson Award for Best Costumes, assisted by Elizabeth Poulton. It was for the colourful array of clothes she whipped up for the wild farce Noises Off. And her next show is on the boards this spring. Michael Klein, Sue Jennings, Paul Pengelly, Ann Stevenson in Noises Off at Guelph Little Theatre. Originally from England, Carmenta’s passion for design and colour started early. 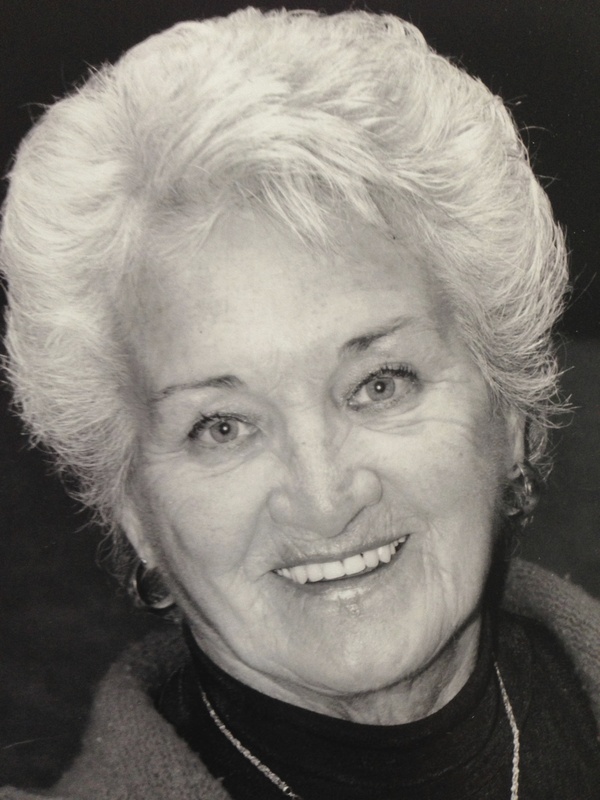 She painted a large mural of swimming star Esther Williams on the wall of her school gym. The painting earned Carmenta a scholarship at Twickenham Technical College & School of Art. At only 15, she was the youngest artist ever admitted to the college, which was since renamed Richmond Upon Thames College. Do your research. Read the script. Talk to the set and lighting designer about colours and shapes that will appear on the stage. If it’s a busy set, you may want to look for simple colours and avoid patterns. Watch rehearsals. Talk to the actors and directors to understand the mood, time, setting and character choices. Consider skin tones – pastels might not work on a pale person, unless it’s the look you want. Coordinate the colour palette through the cast. Use bold colours carefully. Red and yellow are very powerful. If you want to draw focus on the stage, red is your colour. Otherwise, try to avoid it. Be ready for anything. Practice your quick changes. Check your preset, and be ready to mend at a moment’s notice, often between scenes. Some of Carmenta’s favourite projects include costume design for Stepping Out, Calendar Girls, and Come Back to the 5 & Dime. 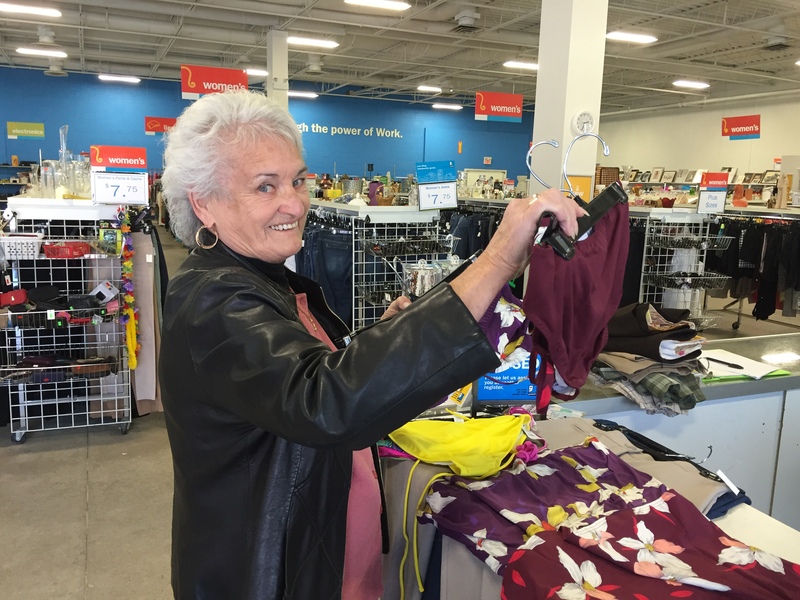 And she’s already hard at work, searching discount racks all over town for her second production of Shirley Valentine, April 26-30 at Fergus Grand Theatre. Here, Carmenta shops for Greek beach wear for the comedy Shirley Valentine. Thrift stores like Goodwill can be a great place to start your costume search. Carmenta is proof positive. Community theatre artists never retire. They simply move on to the next show. In fact, many retired folks have more time to pursue their passion for theatre. This is one wardrobe mistress who is always looking ahead to the next opening night. Fabulous woman, a force to be reckoned with, thanks for writing this!